Large boats stranded at sea can be a big problem, and an even bigger problem to tow them back to shore. It can cost thousands of dollars to help a ship back to land, and the additional fuel used to tow the ships can negatively impact the environment. The idea of using a kitesurf kite to tow boats back to shore was thought of by Yves Parlier, a sailor who was dismasted in his third appearance in the Vendee Globe sailing competition in 2000. He completed the race six weeks after the other competitors. Using a kite would have been a much better way for him to travel considering the circumstances. From this idea, Parlier created “Beyond the Sea”, a consortium which joins his business, Ocea, with other leading maritime companies, such as Porcher Industrie and Cousin Trestec to create the LIBERTYKITE, a kite large enough to pull a ship to shore without the costly resources of a towboat. LIBERTYKITE is constructed from the best technical textiles and synthetic ropes on the market today. The polyester design is able to pull boats up to 60 feet in length. It is currently available for purchase in two different sizes: 10 and 20 meters. This idea to use a kite to tow boats is being worked on to tow larger merchant navy vessels. 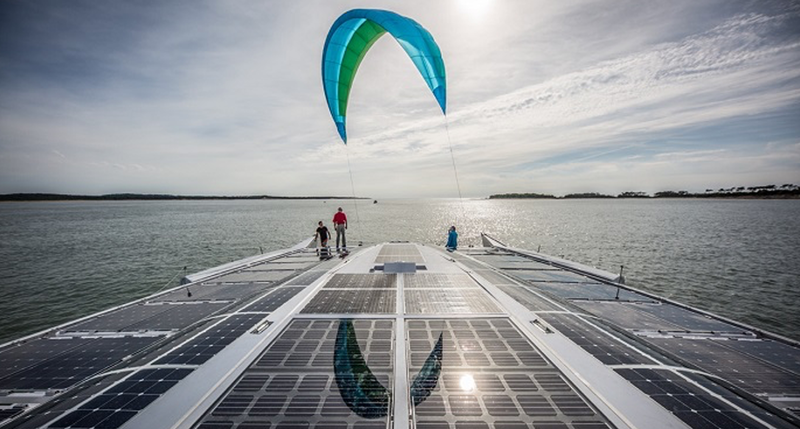 In doing so, the kite would reduce the ship’s fuel emission by 20 percent. “If we consider that 90 % of world trade is conducted by sea, and that there are 100,000 merchant ships and one million fishing boats, this new technology can have a major positive impact on the environment.” says Mr. Parlier.